You need to try American Heritage chocolate. It is sold at Williamsburg and other historic areas. It is awesome! It is made by Mars. It comes in bars that you can grated or in a bag already grated. No more instant for this girl. I'm heading to the mall tomorrow ~ thanks for the tip! This will go nicely with my new flannel pjs ~ ha! That peppermint one is calling my name! I know this well. I used to stock up when I worked at WS. We received a great discount. I also love the pecan pumpkin butter. If you haven't tried it, you must. It comes around Thanksgiving. As per your comment on my latest post...No, we don't ski. I'm laughing a little here because the last time we all went to the mountains to go sledding, 3 of the 5 FGK revolted and sat in the car watching movies on their portable DVD players. They were miserable cold. The last time Jason and I went skiing was on our honeymoon (that was almost 17 years ago). I know we live in Colorado, but we are not cold weather lovers. My son gave this to HighHeeledLife for Christmas and we gave her a hotchocolate thing...lol it's a jug for hot chocolate and serving it etc. She loved it so even if I cant remember what it's called it was a hit! 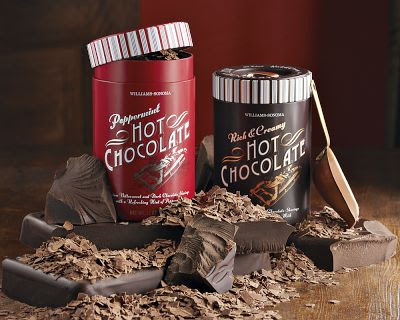 I think I'll be making a trip to Williams-Sonoma next week for this! It sounds amazing! That hot chocolate sounds phenomenal... I definitely plan to try it! Yummy!!! I had Jacque Torres hot chocolate for the first time last month and it was sooo good, but I was looking for something that I could have here in Florida, thanks! !